I came across this article and read the research Microsoft did with Contently’s Document Analytics, thought it was insightful findings. Microsoft discovered that landing pages requiring email addresses in exchange for downloadable content were 25% more effective at capturing email leads, but that embedded email forms within freely accessible content were more effective at capturing content reads. Subscribers who entered their emails in embedded forms were 51% more likely to read the entire piece of content, according to a Contently case study. Here are the images of the difference on where and how the email address was asked by the site. In the first example, it is a standard deployment you usually come across where you land on the page, provide an email address, and then you get the PDF file. The second example is the delayed gate, where you download the PDF file or the material of interests, then after few pages in, you’re asked to provide your email address in order to access rest of the material. As stated in the quote above, it’s fascinating how human psychology plays into different outcome just by asking the email address in different timing. It might not be surprising to some people, but it is interesting from a standpoint where this may give more ideas to how we A/B test and optimize landing pages to drive results that match certain business outcomes. It is common to find marketers obsessed with putting out content to capture more traffic and leads, but in many cases, the value of the material is really within the file and what’s written. A lot of money could have gone into the research, write, and distribute. What good is an email address if people are downloading and not reading it because that’s how end users understand the positioning and value of the companies who provide these materials. That doesn’t mean every marketing objective is to make people read the entire thing. Capturing user attention and gain volume of quality leads as you get in front of your audience are not a bad marketing objective. So if you can pull it off with the standard landing page and gating it, then that’s fine. I guess this opens up more ways for us to test ideas beyond CTA, creative, message, but also “timing” of how we capture leads or reach our audience. I thought I’d share some interesting read that I came across. Enjoy! Here is the original article, check out. Recently I ran several tests for a specific team where we’ve seen double-digit improvements in a goal we were measuring and testing against. The method I used to find the “What to test?” question was not that difficult. Over time, I believe it may be more difficult to find more wins, but here are some ideas which I think you can apply in your work to better understand “How to Analyze and Find High-Value Test Ideas”. A lot of times, when you talk to marketers, they will tell you things like “use analytics”, but I know you folks want to know a little more than that. The best way to start the conversation with your stakeholders is to understand their business and what is important to them. They are the experts in their field. As an analytics expert, you have to be a great listener. I’m sure this applies to many of you, a lot of times the analytics may not be set up perfectly to track the key outcomes for the business users. So the first typical thing to check is, rather the analytics tools are capturing the key data that ties to your business outcomes. Example, PDF downloads, contact sales form submit, order checkout complete, etc. That said, you have to understand what your business’s key end action you want the website to accomplish. Track and analyze all your micro conversions (or end actions)!! Once your analytics tools are set up to track those end actions, work from the bottom and understand what drives the end action that really matters to the business. The goal is to understand and find key pages that are leading to that end action. So if you’re using Google Analytics, use ‘segments’ to create segments around people who converted or not converted, and analyze the pages people land on, bounce, or leave if they don’t convert. You’ll soon find out particular key pages that aren’t home page, and start to give you questions that make you want to know what is happening to those pages that showed up on your radar. Never underestimate the voice of the customers. Tools like Qualaroo make it so easy for marketers and analysts to gather user’s voice from the site, and you have to start leveraging the data to better understand customer’s intent, pain points, opportunities, ideas, etc. User feedbacks in a context of this topic could focus on the pain points or understand if users were able to find the key elements on the page. Like asking “Did you come to the site for XYZ reason?”, and if they answer ‘yes’, then ask them “Were you able to accomplish XYZ” and focus generating questions to gain further insights on why customers could not accomplish. All these qualitative insights can help you gain a better understanding of the size of the problem, or potentially gain ideas on what to test. Remember that the quantitative data from tools like Google Analytics will only give you what is happening to the site, but doesn’t give you the “Why” things are happening in such way. Heatmap and session recordings could be a great tool to use to further dive into the details of usability issues as well. Since heatmap and recordings are qualitative data, those are great tools to have in your marketing technology stack. By now, you have a list of pages where you think you can improve and test some ideas to make it better. Now, the question to ask is which pages are more important. You could base that importance on several things like (not limited to): traffic volume, close to the end action, high-value touch point, etc. You could base that importance on several things like (not limited to): traffic volume, close to the end action, high-value touch point, etc. For example, look for high traffic page with high bounce rate for returning visitors. That could be the first indicator for something to look at and dig deeper. You can also look into surveys to see if there is anything site visitors are complaining about. Another idea is to look at your valuable traffic segments and the key landing pages that differ to that of the low-value visitors. Give higher priority to the ones where visitors who convert are touching. These priorities will help you set where the engineering or design resources go. Why work on something that you can not influence. You find an opportunity on a site that requires an entire layout change that requires some kind of engineering effort. That is probably not a good test to start with if there is an alternative, like optimizing a bad content on a landing page. You want to be able to go after the wins you can really win and build up. In one of my experience, I came across a microsite where the site was owned by another group. However, VOC (voice of the customer) survey indicated some issues on that microsite. Since my team couldn’t immediately impact and take control of that microsite, we then had to focus on what we could immediately take control of. Such as messaging from the website we have authority to change, etc. Take into consideration of resource, budget, and time factoring it into your assessment. In order to operate and test fast, and to try many things, you’ll have to focus on things that are easy to set up or execute on. One important factor to think about is the quality of the test, too. I may come to sound like doing a lot of test fast is the way to go, but if you’ve done the steps 1 to 4 really well, then it doesn’t have to be about numbers of tests, given the cost of quality of the test may outweigh the quantity. The main point is doing these steps or homework well so that you identify the are of high-value with potential to give you better bang for the buck, so the test proves your great ideas and ultimately contribute to the business. Hopefully, these five steps were able to give you some good ideas on where to start and leverage data to build high-value tests. Enjoy analyzing and testing!! 1. Type of audience the site is attracting. 2. Type of audience is the e-commerce site converting. 3. Type of audiences the site should attract more due to a better opportunity to convert. First thing marketers typically do is plan their marketing effort around reaching the audience they need to go after. So the 1st point here is really looking at the traffic to your site by the audience type. I’ll be using data from ‘Affinity Category’ as the main examples. Here is an example. This data shows a segment based on sessions that hit a certain section of the site. Notice the kinds of affinity categories this site section if attracting. You’ll notice that this data is really different when we sort with different data from sessions. If you sort the data by the transaction, you may see that the site is attracting and converting audiences that are different from above. Hence people who are buying could be different from the audience you’re getting the most traffic from. If you’re paying and targeting for an audience who aren’t buying your service or product, then you might want to rethink your paid media strategy. This tells you where you need to acquire more traffic and the kind of audience you could be targeting more of to drive higher sales or business outcomes. I guess we’ll have to acquire more cat lovers who are local news junkies. One can argue that the audience data may not be accurate. However, it is what Google AdWords are likely going to be using to help you target your ad, and if it is this data that is being recorded saying the cat lovers are likely going to convert, why not take advantage of it. What marketers need to be aware is that chasing after an audience that does not fall in the target audience the brand is chasing after is a debate you need to have internally within your company/team. Performance is one thing, but if you’re in a business where audience type matters to your brand and the overall impact of how your brand is perceived, then it is a very important discussion that the entire marketing team needs to be aligned on. So that one department is not chasing after an audience for the sake of conversion, but the debate about how you can strategically attract and convert the right kind of audience for the brand and measure it. In that case, perhaps your goal is to make the all that list we reviewed to have certain audience dominate the top 3.0, but think about it. First, let’s analyze your data. Digital marketing is changing really fast. What digital marketing had a hard time to measure and integrating data such as the demographic or psychographic data is becoming something of a common practice. Looking at A/B testing tools and where it is going at integrating 3rd party audience data is something to look out for, but it won’t be surprising when you see more of this with web analytics as well. Other interesting ways to use this data is to segment affinity category data and see where this audience land on the site and behave. You might have thought you were reaching that audience on a certain section of your site, but it may turn out you have more work to do to place the right message for the right audience on places you never put many efforts on. Maybe this something I can write more about next time. As I was checking out the eConsultancy’s survey on ‘Top Priority for Digital Marketers for 2013‘ crossed my mind, and decided to take a look at once again. We live in a world where real time data is used to enhance user experience, and often called as ‘Personalization’. Marketers are starting to take advantage of such capabilities and you should take notice of this. It was interesting to me, especially given that I lead building a Content and Conversion Rate Optimization discipline in 2013, I have more appreciation for this area of marketing practice of ‘targeting and personalization’. Early last year, Targeting & Personalization was a topic that was way far away from where my mind was at. As for optimization, I applied a simple methodology on building experiments based on setting a goal, plan, set up tests, execute and review, and then working at it over and over to optimize customer experience. It worked. As you do as many tests as we did (more than 100 in one year), you start to realize certain things. Such as realizing to ask questions like “How scalable is manual A/B testing?” or “Do we really have to have change requests for every possible success factors we know that performs?”. I felt that even what I’ve started was a simple first step into website optimization, we are ahead of the curve when it comes to the adoption of optimization. Probably even more mature than many companies when it actually comes to content site-wide testing. Purchase history is only leveraged by 21% of marketing organizations, while 77% of those say it has a “high impact on ROI”. Behavioral data is employed by 20% of respondents, but 68% of them report strong ROI. Social graph data has the highest ratio of all; only 6% usage, while nearly all of those organizations (88%) giving it high marks for ROI. Now it is 2014, and we have learned a lot, technology has changed a lot as well. Then I read this article “The rise of context for customizing digital experience” and was pretty excited because it basically confirms some digital marketing practices or fundamentals I was firm about. You may not have to modify or break the privacy policies to do content targeting. At least if you’re planning to use non-personal info add more context to what you have about behavior. Contextual data could be enhanced to be more powerful with many other data such as Social, 3rd party data like Weather, CRM profile data (using non-personal attributes like customer ID instead of PII), etc. You don’t have to build a microsite or add web pages by wasting resources and money, but instead being more targeted and smarter by leveraging technology and place the right message at the right timing. As the article says at the end — brands don’t have to be invasive to know about consumer’s circumstances, the context of their interaction, what is happening in the environment, to deliver a better experience, but still not knowing actually who they are. That’s what happens every day when we interact with people we don’t know personally. What is awesome about this is, technology is available in the market for brands to start to capitalize from. An example of a content when targeted based location, weather, temperature, Paid Search (AdWords) adverts. 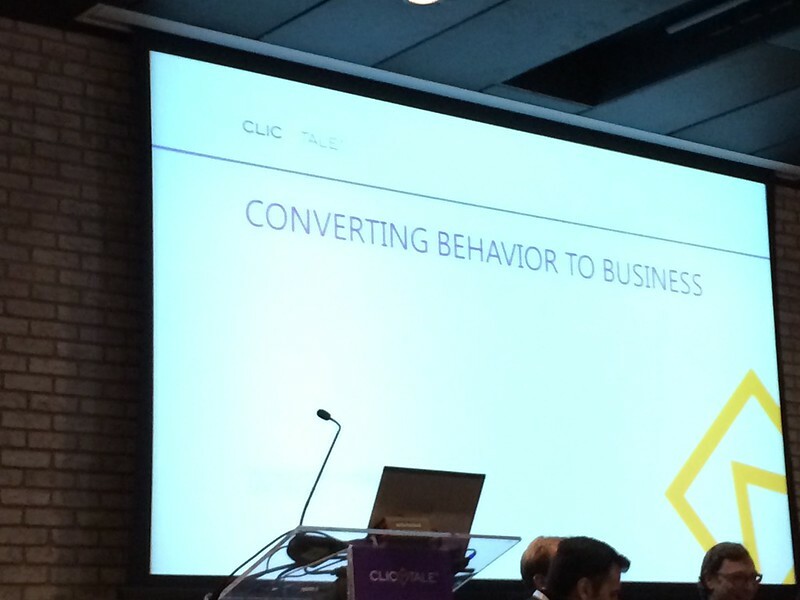 In late October, I flew to New York to speak for Clicktale’s first conference on ‘Converting Customer Behavior to Business’. I have to say, it was awesome to be there to be part of the speaker along with Bryan Eisenberg and Seth Godin. I’d like to share with my blog reader on the high-level stuff that I covered. Many marketers get this part wrong. It is very common to hear from analysts who are struggling to get out of being a reporting analyst that marketers who he/she supports always involve the analytics after they’ve planned or executed the campaign. In other words, what they are doing is Set Ready -> Fire -> Aim, that is why the analytics person gets involved after the marketers fired off their marketing efforts. Now, here are what goes into the each point, but it is important that the entire marketing team and analytics are following a discipline of Set Ready -> Aim -> Fire -> Debrief. Note: notice the difference on the order of Aim and Fire. The process is very important for anything in digital marketing, analytics, and optimization. What’s awesome about digital marketing that makes it very different from traditional media is, you can fail and raise back up fast, and optimize your efforts anytime. Now, here is a process I use for optimization and I’m sure everyone got something similar which comes in various flavors. When you put this process with the earlier Set Ready, Aim, Fire, and Debrief, this is what it’ll look like. Don’t forget this. KPI is key performance indicator and you want to track that critical few. The GOAL right. All measurements for the strategies and tactics are metrics to help you achieve and optimize towards the goal. In many cases, Business objectives are not necessarily aligned with Customer’s objectives. Check out the example from the table below. Your website experience issues could come from not meeting customer objective and goals since it is easy to get focused and locked on the business objectives. Now you know your process, and you know what problems to solve to hit your target. For every pain points or hypothesis, you have to improve your web site’s experience you’ll need to go test it. A/B testing tools are affordable now, and there is no reason not to test. The more you wait and not test, you’re just leaving money on the table. Or your competitors are just going to get better than you. Testing is the most important thing you can do to learn and optimize to convert customers for your business. It is very important to respect the process and keep on going through it many times and got to do it fast. It is like you having to train your muscles to work for you in a certain way. This point is like highlighting the importance to train yourself to build that cadence for optimization. Avoid getting caught on the bad numbers. For example, when you look at bounce rates for areas to optimize, it is easy to get caught up on those numbers (high bounced pages) and lose the bigger picture. That’s why you have to keep on analyzing and dig deeper beyond bounce rates. Focusing on the positive outcomes and finding the ‘Bright Spot’ may give you more ideas and angles to approach problem-solving. If your test works and you see great results, then celebrate and try to see if you can repeat that on another part of the website. It is pretty common to hear people ask how big is the analytics team and all. Obviously, depending on the size of the company and where they’re prioritizing resources will vary, but if some assumptions are put in place that we don’t have a good amount of budget, resources, or tools. In that case, you don’t or won’t have a big analytics team, what would we analytics person do or can do with such limitations. If you look up for growth hacker (who uses data to help make a startup grow) and see what they’re doing in start-ups, it’ll be evident that they’re getting stuff done with very limited resources and budget. They’re able to get stuff done because they work with their team, get engineers involved, they have to work across different groups. A common thing that big enterprise analytics people should be thinking is that how do you work across departments and make sure you get your stuff done, but scale so that you’re influencing beyond your area and changing how departments talk to each other. What I mean is, if there is anything you need to do like getting a database set up or getting some creatives for A/B testing, don’t be afraid to get them to work together. Share the results that you see on your measurement and optimization projects. Get them excited so that they want to work with you. This is a pretty good recipe to make your optimization process run faster. Hope you were able to enjoy the high-level stuff that I shared at the Clicktale conference, and hope that gave you some spark for an idea or something to take back to your work. All the process and effort you put in will definitely help you convert customers for your business. I was reading some blogs covering the Growth Hacking event from Open Network Lab and took away with some thoughts around what Andy Johns has shared. It is very interesting and impressive how the growth hackers in Silicon Valley has approached to find opportunities to optimize by testing while focusing on influencing very few KPIs (key performance indicators). In many big companies, experts doing Analytics and Optimization are not called ‘growth hacker’, but certainly, could be called as such. In most cases they are measuring, setting hypothesis to test, testing, optimize, rinse, and repeat to improve their digital marketing or business performance. While big companies may not really try to compound the growth in traffic like startups trying to grow beyond 20% plus, typical digital marketing team in big companies are a small part of the organization which runs like a little startup. If not focused on building traffic growth, they are usually focused on optimizing the crap out the site to improve conversions, conversion rate, customer satisfaction, etc. While big companies may not really try to compound the growth in traffic like startups trying to grow beyond 20% plus, typical digital marketing team in big companies are a small part of the organization which runs like a little startup. At least from an operational standpoint when the team is doing tons of testing. If not focused on building traffic growth, they are usually focused on optimizing the crap out the site to improve conversions, conversion rate, customer satisfaction, etc. Either way, there are many interesting things we can learn from those growth hacker cases, but let me highlight the two cases in various blogs I read. The research resulted in a conclusion that the new functionality did not contribute to improved retention of the new users or did not contribute to maximizing retention. What’s interesting is that they’ve done this for 2 years without adding new functionality and just kept on optimizing, while MySpace was focusing on monetizing (even placing ads on user registration form). The result was, as you may know, Facebook is now a very successful social networking site. Thoroughly researched users’ pain points from user’s point of view. Over time, the team was able to: ax the feed of tweets, shrink to only a few profile pictures, minimize the copy, cut the search bar, and enlarge the signup window so it took 1/3 of the page. — End result: 2-3x uptick in signups within 24 hours. Moved picking a twitter handle to a secondary page and suggested available names to the customer. Users don’t care about how cool or appropriate their handle is. Now Twitter gets them through the door into the product much faster. — End result: a 2x uptick in signups within 24 hours. As you can see these successful companies had already started optimizing from their early days of their growth stage, and growth hacker was able to contribute in accelerating their already growing user base. These optimization efforts are no different from what the analytics and optimization teams are doing in big corporations. Silicon Valley likes to come up with these buzz words to define specific work, methodology, role, etc. However, an important thing is to really to take away with their key learnings and apply that towards our day to day job. These optimization efforts are no different from what the analytics and optimization teams are doing in big corporations. Silicon Valley likes to come up with these buzz words to define specific work, methodology, role, etc. However, an important thing is to really to take away with their key learnings and apply that towards our day to day job. Are you tracking many KPIs? think twice or even more about what KPI means, KEY performance indicator. Many of these growth hackers in the early stage of start-ups are short on resource and budget. So in order to move quick and be effective, they really have to focus on the critical few KPI and keep on optimizing the crap out of it. In some cases, the growth team will refer to that key measure as a “North Star Metric”. I remember in early days of eMetrics Summit and in other ‘web’ analytics conferences, many people were curious how one company gained resources or budgets to buy tools, or learn how to get executive’s attention, etc. It is interesting to see how these start ups were able to collaborate across team/departments by creating a small elite team and tackle common problems. Definitely not about getting more from the top. For example, in Quora, they started with engineers, designer, product manager, and data scientist/analytics, total to less than 10 people for the growth team. They’d create their process, methodology, and optimize against that common goal, and if needed a tool they would build it. Probably not asking their executives for more money. Interesting that you hear comments like, tools like Google Analytics provide too much data, so they’d build tools and iterate to capture great data against that one KPI. In many cases for Facebook, they’d spend 5 days analyzing data and spend 2 days executing. So if you’re spending 80% developing or executing and spending 20% on analysis, then you might want to consider flipping that to spend 80% on analyzing and 20% on executing. This is actually a big deal, as you think about this, what probably comes to mind (especially for BIG companies) is how slow your IT or web engineers are and how you/marketers expect analytics team to turn around with reports quickly. It is very common to see a reality where, say start to the end of a project is 100%, analytics person analyze and come up with reports in 20% mark, and then the rest of execution takes 80% of the project time. Hmm, no wonder resources are always short somewhere… Perhaps things will look very different if you spent 80% on analyzing to understand your customer and spend 20% on execution like what Facebook did. If you’re serious about making an impact on customer journey or user experience, maybe you should start evangelizing the culture where you obsess about understanding your customer and expect speed on the execution side. I don’t think it is about adding more resource/budget to the engineers, it is probably more about the mindset (hence hiring great talent) and getting the process right and optimizing the process. Facebook or Quora’s case really justifies that as they hire best in class talents, and even build tools to measure (saves cost and execute faster). With these 3 key takeaways in mind, I think many folks practicing analytics and optimization in big companies could re-think about their role and the potential impact they can have on their business. In big companies, your team or department may only be a sub set of the company’s main function or goal, so when you treat your department as a small company like a startup, having that ‘Growth Hacker’ mindset could have a huge impact on how you view and work solving problems. You can be more focused on the critical few, from customer’s point of view, at a smaller budget, collaborate more, and perform by adding value to your shareholders. When you perform well, people will start to learn from your efforts, strategies, tactics, methodology, mindset, etc. That will translate to building growth hacking culture in your company.